Sourdough bread has always been one of my favorites. The tangy, salty flavor is unique and the chewy texture is pleasing and unlike the breads we are all used to. 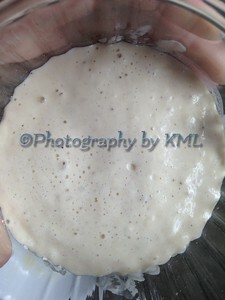 I have tried making sourdough starter from scratch, but I didn't have much luck with it. This past spring my daughter had one given to her, and she shared some with me. Several months later my beautiful starter is still thriving and producing exceptional bread each time I need it. I have adapted my favorite multigrain bread recipe to using the starter in it, and I find it even better with this added ingredient. Keeping the starter happy though takes some practice. When it's bubbling and expanding each time it's fed, then it is active and healthy. The only ingredients are flour and water, and once they have harvested the yeast from the air, that's when the magic starts. The starter gets fed more flour and water on a daily basis. The amounts need to be doubled each day in order to give it enough to eat. But it can quickly get out of hand at this rate. I usually keep mine at a small amount until I am ready to make my bread, then I start the doubling amount a couple of days beforehand. An 1/8 of a cup does me well until I need to bake, then I ramp up the amounts. That way, I am only removing a spoonful a day before I feed it so I can feed it without it getting out of control. 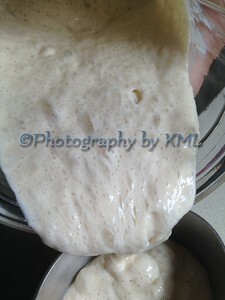 I have found that giving it a tad less water than the flour yields the best results for the starter to rise. A healthy starter will rise and fall each day and I have found that using it at it's full height gives the best results for the bread. 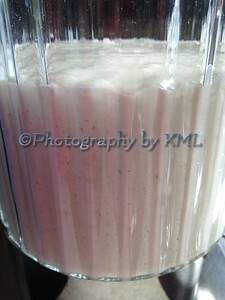 Check out the next image to see the fullness of the batter as it is poured - just beautiful! The natural yeasts in the bread make it unnecessary to use commercial yeast. The rising times take longer for the bread. Several of my recipes use added yeast, and they work well with the natural ones in the starter to produce a lighter, softer bread than the traditional sourdough. This bread is a healthy alternative to traditional breads, and in my next post, I will discuss these benefits.